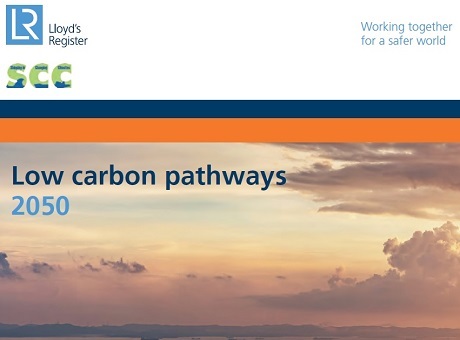 Lloyd’s Register (LR) and Shipping in Changing Climates (SCC), a $4m multi-university and cross industry research project funded by EPRSC, has today released Low Carbon Pathways 2050 – a new study that details a number of potential pathways for the shipping industry’s transition to a low carbon future. The report underlines the need for shipping to start its decarbonisation imminently – as stringency increases over time, increasingly high-cost mitigation steps are required. The later we leave decarbonisation, the more rapid and potentially disruptive it will be for shipping. The greenhouse gas (GHG) emissions of shipping are a consequence of the carbon intensity of shipping’s energy supply, the energy efficiency of shipping and the demand for shipping. The Paris Agreement confirmed that it was not a question of whether climate change should be addressed but a question of how, and it was clear that everyone will have to contribute. Shipping currently accounts for 2.33% of global CO2 emissions and there will be no space in the carbon budget to allow even the emissions of shipping (currently approximately 1 Gt per annum) to be ignored. The International Maritime Organization (IMO), agreed at the 69th session of the Marine Environment Protection Committee (MEPC) to establish a working group to discuss the matter further at MEPC 70 from 24–28 October 2016. There are a number of submissions to MEPC 70 on this subject and we all expect important discussions to take place on how this issue is to be progressed. Low Carbon Pathways 2050, presented by Katharine Palmer, LR’s Environment and Sustainability Manager, and Carlo Raucci of the Shipping in Changing Climates project, aims to contribute towards these discussions by providing understanding on the potential pathways to the decarbonisation of the global shipping industry. Consistent with the Paris Agreement, the report gives particular focus on the technological and operational specifications of the global fleet and how these may change in relation to a given rate of decarbonisation. The report asks the question: given the best available evidence, what is a reasonable estimate of how shipping might be required to change and what does this look like? Shipping will need to start its decarbonisation imminently – as stringency increases over time, increasingly high-cost mitigation steps are required. The later we leave decarbonisation, the more rapid and potentially disruptive it will be for shipping. All are ‘possible’ options for achieving absolute reductions of a scale and timeliness consistent with the Paris Agreement. A substitute for fossil fuel will still be required as energy efficiency improvements alone will not be sufficient in the medium to long term. Energy storage in batteries and renewable energy sources will have important roles to play, but are likely to still leave a requirement for a liquid fuel source. Additional regulations that may be developed for other emissions need to be considered, for example; methane, black carbon and particulate matter. Technological and operational characteristics are just some of the considerations that need to be taken into account. Following this initial study, LR and SCC will convene industry roundtable discussions on the findings of the report and facilitate the development of future possible scenarios in collaboration with the industry to create and share knowledge and tools that can contribute to reducing GHGs from shipping. Low Carbon Pathways 2050is the latest in LR’s series of reports looking at fuel and technology trends for the marine industry, aimed at developing new knowledge and tools that can contribute to policy debate. Global Marine Trends 2030. Previous reports include Global Marine Trends 2030, Global Marine Fuel Trends 2030 and Global Marine Technology Trends 2030. Lloyd’s Register (LR) is a global engineering, technical and business services organisation wholly owned by the Lloyd’s Register Foundation, a UK charity dedicated to research and education in science and engineering. Founded in 1760 as a marine classification society, LR now operates across many industry sectors, with over 8,000 employees in 78 countries. LR has a long-standing reputation for integrity, impartiality and technical excellence. Its compliance, risk and technical consultancy services give clients confidence that their assets and businesses are safe, sustainable and dependable. Through our global technology centres and research network, LR is at the forefront of understanding the application of new science and technology to future-proof our clients’ businesses. Shipping in Changing Climates (SCC) is a £4m multi-university and cross-industry research project funded for 3.5 years by the UK Engineering and Physical Sciences Research Council (EPSRC). The SCC project uses a whole systems approach to understand the scope for greater energy efficiency on the supply side, understand the demand-side drivers, and understand the supply and demand interactions and their potential future evolution in shipping. Lloyd’s Register and variants of it are trading names of Lloyd’s Register Group Limited, its subsidiaries and affiliates.